ZIC X7 FE, 0W-20 is a Premium Fully Synthetic Motor Oil, engineered to maximize fuel savings. ZIC X7 FE, 0W-20 unique friction modifiers maximize engines’ performance for dynamic driving. ZIC X7 FE, 0W-20 is formulated with VHVI & Yubase Technology for lower engine wear and longer drain interval. 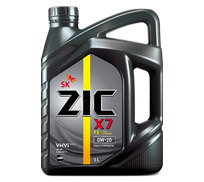 ZIC X7 FE, 0W-20 generates a strong oil film to protect engine from wear. ZIC X7 FE, 0W-20 is especially developed for all latest gasoline engines. 100% Fully Synthetic Engine Oil With Highest Fuel Saving Efficiency. Recommended for Gasoline/CNG/LPG/Ethanol Blended Fuel. Exceeds the requirements of dexos1.